Yeah, you'd need a swig of something strong after a few days of going through that! 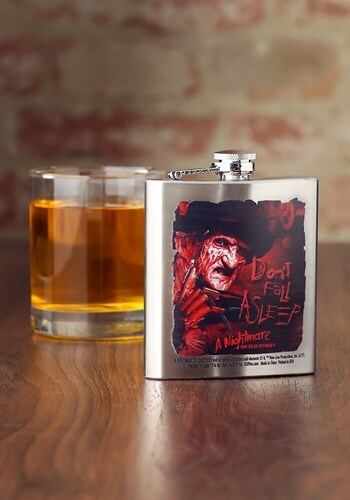 The good news is that The Nightmare on Elm Street Flask will help you keep a small dose of your favorite adult beverage at hand... with a little reminder of what might await you in your dreams. This Nightmare on Elm Street Flaks is made out of stainless steel and has an 8-ounce capacity. The twist off lid is attached to the flask with a small hinge, so you'll never lose the lid. The side of the flask has the printed image of Freddy Krueger on the side. We recommend hand washing this flask to ensure that the painted image on the side stays clear and vivid. Whether you're an Elm Street resident who needs a reminder of what awaits you in your dreams, or you're just a horror movie fan who needs a new flask, this Freddy Krueger flask is great for you!